This entry was posted in General and tagged bulgaria, georgia, moldova, romania. Bookmark the permalink. 8 Responses to Homemade wine – eliminate or celebrate? I’m with you. Actually, I’m looking forward to reading Jamie Goode’s book, Flawless. I have a broad mind when it comes to wine faults. I don’t like obviously faulty wine, but I think my idea of a fault is different to the more restrictive “IMW” view, and the one most likely to be held by older wine gammons. I also think home made wine not intended for sale can be fruity and wholesome, as indeed my latest batch of Frühburgunder proves…my best yet. I’m also not keen on industrial produce. Wherever it is from. Thanks, David. I stick to deciding whether I like a wine or not, rather than fretting whether it is faulty or not. But having said that, if there is a whiff of TCA then I most certainly will not like it. Anything else depends on intensity and context – but that is the same with many flavour characteristics that are not normally regarded as faults. I remember when the best wine in Georgia came out of a used plastic bottle. And then it got better. 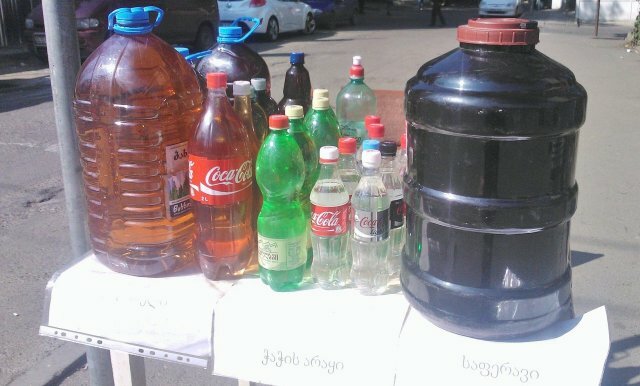 You will never get the Georgians to give up homemade wine. It is a central part of the culture. I realized this when I moved here and wanted to learn a bit of the language, so I picked up a first grade reader, figuring I’d start where the Georgians do. The first chapter was on the grape harvest. First grade. So faulty or not, homemade wine is in their blood. There is a well-known trick here for extending a meager harvest of grapes, to make “manufactured” wine at home from the dregs of the first batch. They siphon off most of the good wine, leave the mash and a bit of the original and then add sugar water to the lot and allow it to referment. The result is a headache producing brew much lighter in color than the typical Kakhetian style of skin contact wine, and chances are if you’ve had “bad” homemade wine, this is what you were drinking. Though hygiene is also a problem in places too, and bret goes unrecognized. But largely, this second run is sold for profit and the good stuff kept for family use, unless money is tight. Learning who sells the fake version and who sells the real stuff can take years and several introductions. Thank you for the interesting insights, Amanda! Though I don’t think the bad homemade wine I had was the “manufactured” version – it was musty. If the bottle ever had a cork in it (which I doubt) I’d say it was corked. I’ve also had my fair share of brett in Georgian wine, but do not mind that too much. I have not read the book, but as a wine professional for over 40 years, with much exposure to the ‘home made’ wines in Bulgaria, Turkey, Greece, Slovenia etc. I applaud them for their differences and authenticity. I many cases, there are historic and cultural reasons for the style, and frankly, who are we from the ‘west’ to call them ‘flawed’? I am not a fan at all of folks from more modern wine regions stepping into these regions to teach them a thing or two. Some of my favorite wine experiences have been with these ‘flawed, natural’ wines in Melnik, Bulgaria and Ayvalic Turkey over dinner with the winemaker. If you don’t like these wines, move on to another region. Leave missionary work to others.